A two day wedding extravaganza for £8500! – that includes two whole days of celebration, three meals, two venues and a band! 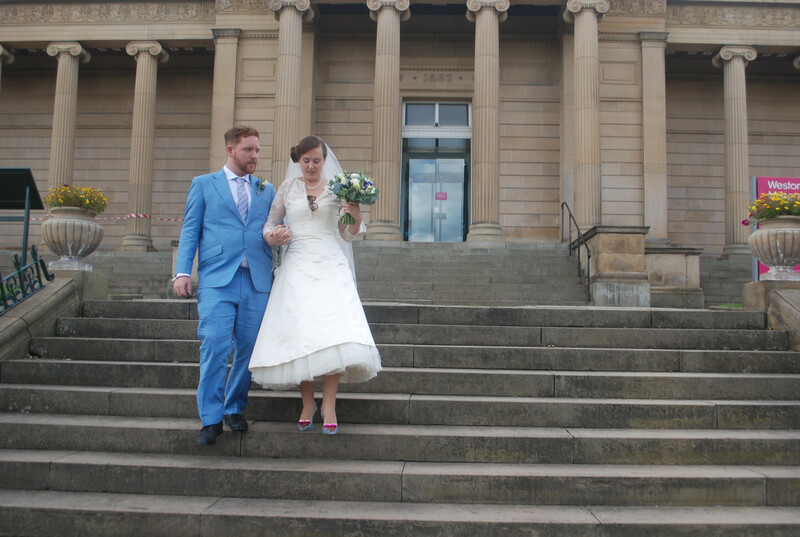 We married at Weston Park Bandstand in Sheffield. 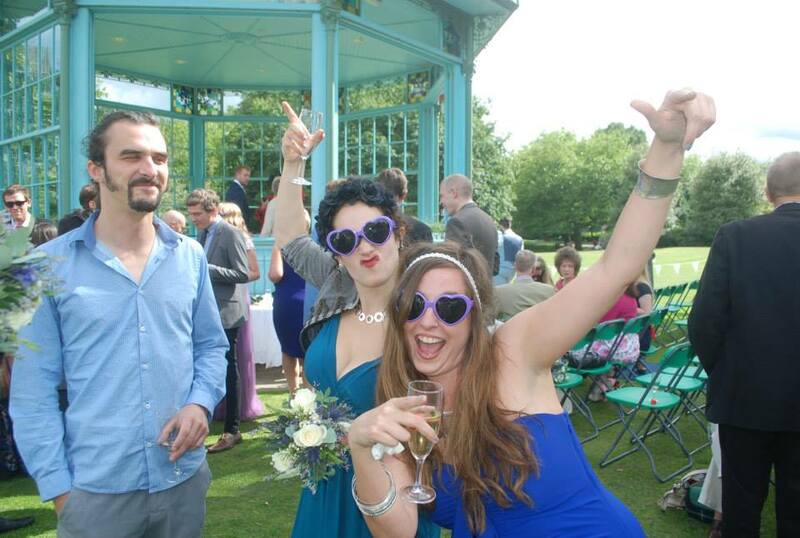 I used to work in the museum in the park and both Liam and I were keen on a fairly ‘outdoorsy’ wedding. The bandstand and the park are beautiful and we liked that it was quite a public, relaxed environment too. Going for a Thursday afternoon saved us about £100 on venue hire – I think it was £700 for a weekday booking – and as we did it at 2pm, a few people took a late lunch break to come and watch. 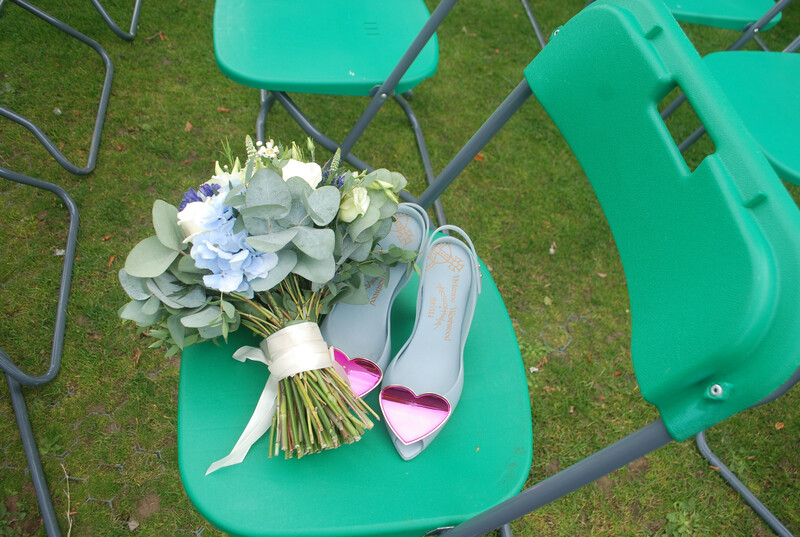 We used the chairs that belonged to the City Council team who manage the ceremonies there, and any overspill just stood around the bandstand – which provided 360 degree views with its glass, retractable walls. Luckily, it was sunny all through the day as we might have had difficulties otherwise, and this made the park the perfect venue to sit and drink fizz all afternoon. 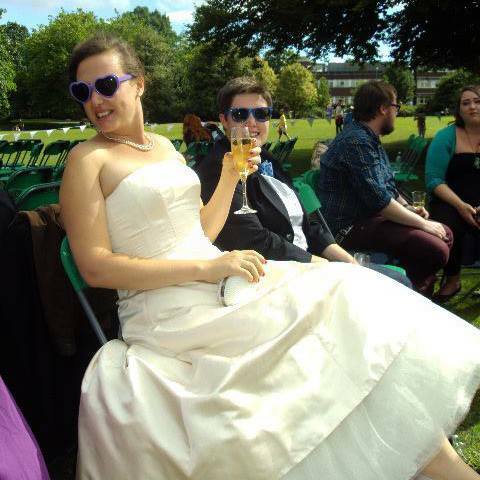 We were allowed to bring our own drinks and just hired glasses (free from Tesco when Liam’s parents bought some wine there – and only £1 per glass for any breakages). 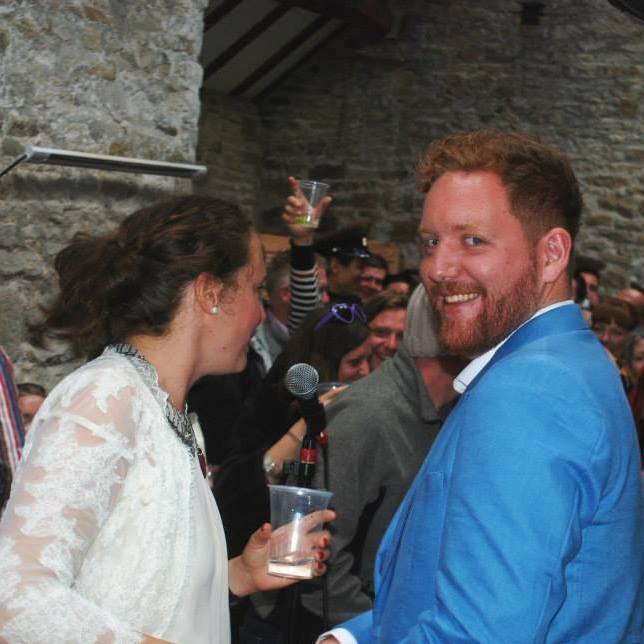 We took our own speakers which the best men (yes men plural – there were five of them!) set up for us, along with décor around the bandstand, before we arrived, and we just made playlists of our favourite songs on my tablet to play through the afternoon. On the Thursday evening, we went to The Milestone in Kelham Island, Sheffield for a sit down meal for 60 of our closest friends and family. 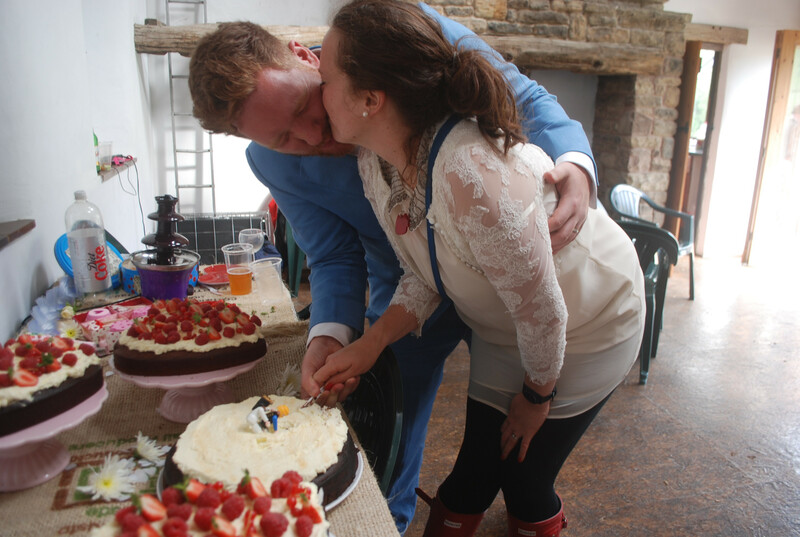 The Milestone were amazing – the food is fantastic, and they stuck to their regular Early Bird deal despite knowing it was a wedding, and we got the whole upstairs room to ourselves for no extra cost. It worked out at £16.50 per person for three courses and a glass of wine or beer. Beyond that, guests bought their own drinks at the bar which worked well I think. After we’d eaten, they moved the tables to the sides and put on our music – and didn’t even mind the loud singing and dancing on tables (well – they were very tolerant about it anyway!) We hired Shatton Hall’s Townfield Barn in Shatton, Hope Valley for three days (midday Friday to midday Sunday) at a cost of £1200. It was just such a beautiful environment and we were keen to show the Peak District around Sheffield to our friends and family from further afield. We hired out two of the farm cottages up the track – one for Liam and I and one for my sisters and their children – which was treat but mega helpful if you have guests with kids coming who want a drink! 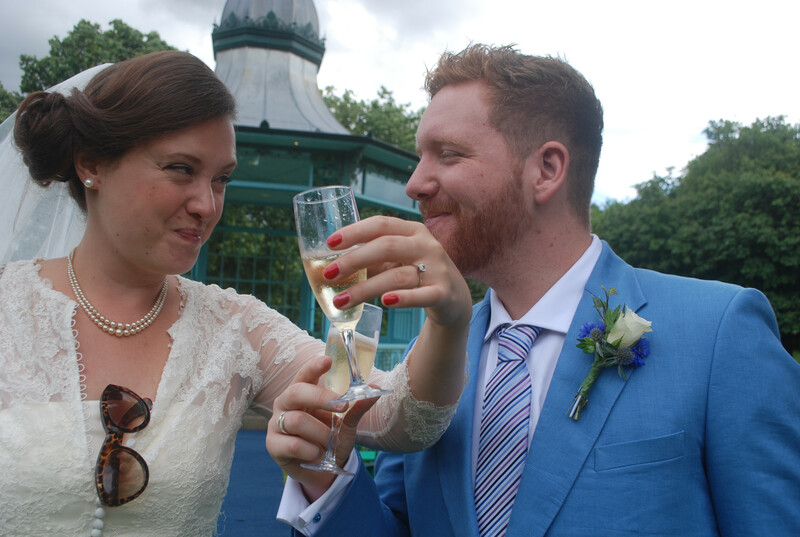 It was wonderful being somewhere that didn’t have a ‘wedding team’ – it meant we could do what we wanted and we saved so much money on catering, bringing some booze ourselves and then asking guests to bring some too, and just generally being able to shop around on everything. The fields around the barn allowed for camping for about 50 people too, and provided space for rounders, wheelbarrow racing and dog racing (with our pets – no animals were harmed, I promise). It was great having Friday afternoon as downtime with a few friends and relatives to set up décor and drink champagne in the sun, and having the camp space for those who wanted to stay over either of the two nights. We had a total of 120 guests at the ceremony and reception. My shoes were Vivienne Westwood Melissa's in dove blue, cherry scented, rubber heels with pink, metallic hearts. They were seconds from eBay – I think I paid about £70 (RRP £130ish) My veil also came from Blissful Daze and it was about £60. I restrung my Nana’s pearls to wear as my ‘something old’ for the ceremony, which I really enjoyed wearing. I did get quotes to get them done professionally but it was quite last minute on my part and as soon as they sniffed out it was under pressure and for a wedding, I knew I wasn’t going to get a bargain. I just did it with a needle and thick thread myself one afternoon and saved £50! For the party day on the Saturday, my sister bought me an anatomical heart necklace from Lady Muck of Whitstable - whose jewellery I love anyway - and I thought this was a great, playful twist on a romantic look for a wedding! ‘A Suit that Fits’ made Liam’s suit to measure, and he basically got to design it himself, with some expert advice on what would work well. 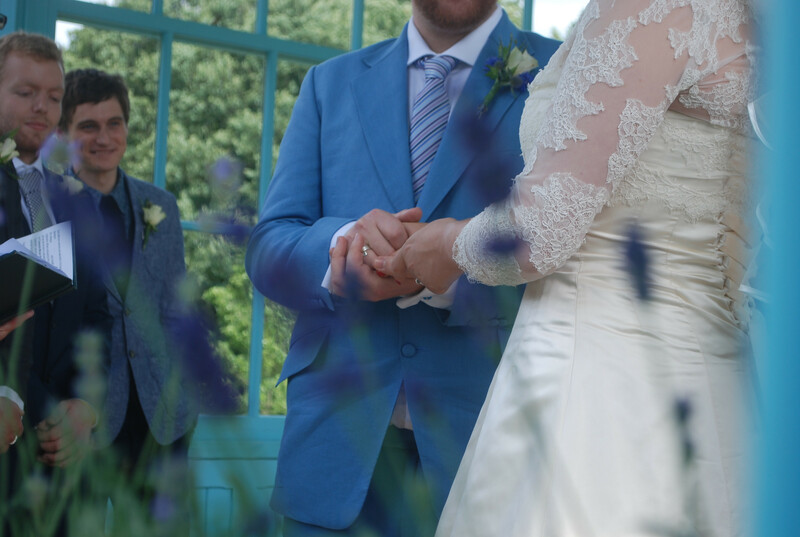 He had a really strong idea about the powder blue colour, which led our visual theme really, so it was great to find somewhere that would make that to measure, and quite affordably. 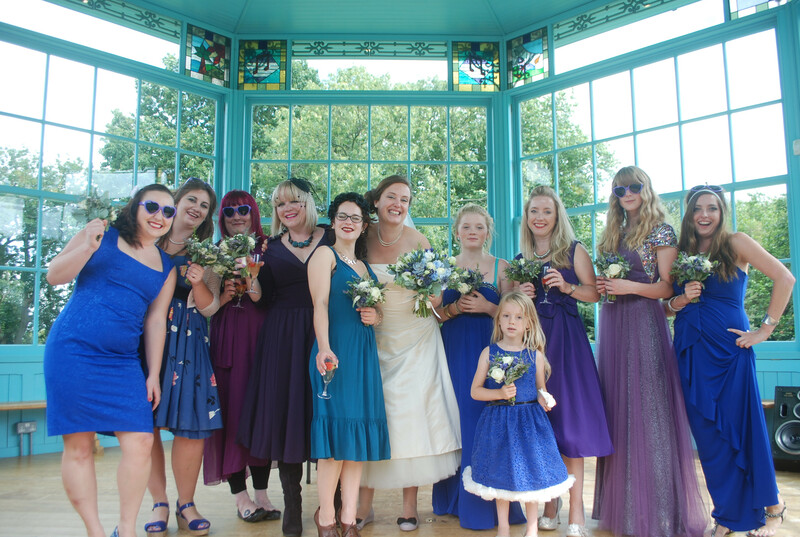 As we couldn’t afford to buy the bridesmaids’ dresses (I had 10!) and they ranged from six to forty something, I decided it was best to let them be fairly free about what they wore! They were advised to choose from soft blues to soft purples and I think it worked really well. Bridesmaid's Accessories: Their own May and Emily of Homemade by Thelma’s in Nether Edge, Sheffield made ours on a very reasonable budget. 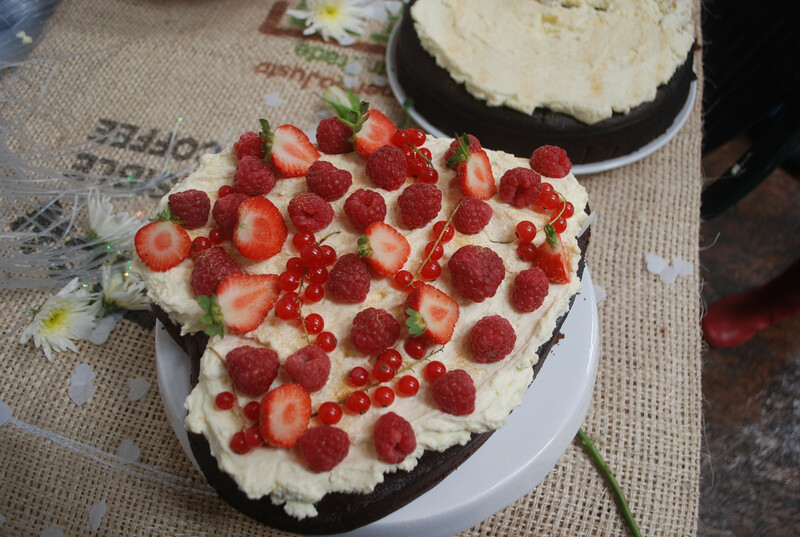 We had five delicious chocolate Guinness cakes (our fave) and we bought second-hand toy Playmobil figures to go on top as the bride and groom! Liam’s Mum did our reception flowers with a mixture of some she’d grown and some bought ones which was brilliant, and arranged formal bouquets from Swallows and Damsons on Abbeydale Rd in Sheffield. One of my bridesmaids’ Mum is a hairdresser (the wonderful Sue Cunningham) so she trimmed my hair for me in the months before the wedding then came to the house and styled it for me on the day of the ceremony. It was fab having someone I knew as the morning was full of friends, family and laughter and having a stranger there would have felt weird to me! I did my own make up both days. 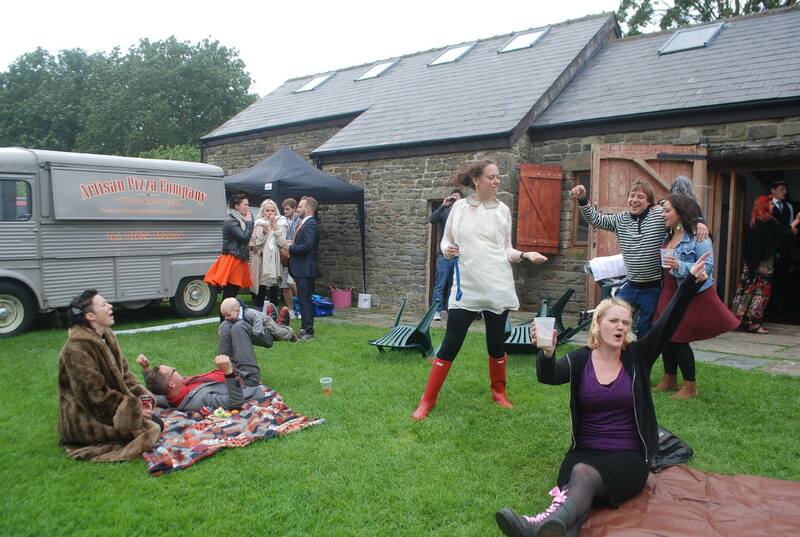 In fact, I hardly wore any the party day, which was one of the lovely things about having a countryside party – it felt relaxed and very informal. Liam hand drew our invite design and I Photoshopped the colours and text and sent it to print with DS Print in Crookes, Sheffield. I think 150 A5 postcards came to about £40. We bought a pack of gold envelopes online and wrote further instructions which were photocopied and added. Finally, Liam made a Wix website with all the key info on for those annoying moments when people lose the directions, taxi numbers etc you sent out months before! Whirlow Hall Farm (local farm and charity we were keen to support) provided a barbecue of sausages and veggie/vegan kebabs, plus salads and rolls for lunch on the Saturday. It was affordable and we told friends to feel free to bring a buffet dish or pudding too if they wanted to, which worked really well. My brother-in-law runs Homage2Fromage (www.clubhomage2fromage.co.uk) and he provided an amazing cheeseboard for people to tuck into through the afternoon. Later on, The Artisan Pizza Co arrived in their vintage Citroen campervan with a wood-fired oven and baked a selection of amazing pizzas, including making a vegan version to order when asked. All this food did add up, but as two massive foodies, catering was a priority!! A relaxed, personal three day celebration, with different aspects that everyone could enjoy…and for nobody to ever feel underfed or bored! My Dad collects antiques so gave or lent us a lot of décor which saved a fortune, as the barn comes in a fairly natural state, ready for you to dress. 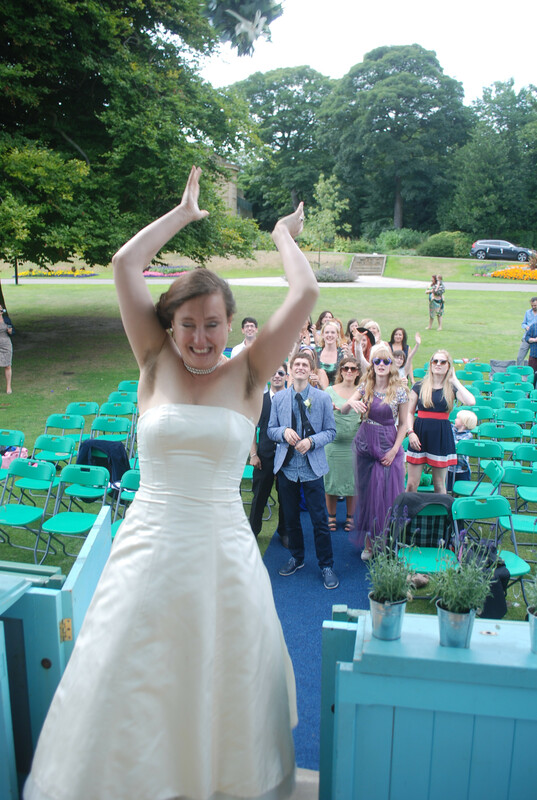 I also bought lots of blue balloons off Amazon, and a few weeks before the wedding a troupe of bridesmaids and friends spent a day of hard labour in our sunny garden making bunting and planting old wooden boxes. Dad had stenciled with our initials with lavender, strawberries, herbs and salad leaves as table decorations. That was a lovely day and other than the bottle of gin and snacks I laid on, it hardly cost us anything to produce 50 metres of bunting and lots of beautiful plant boxes. We went to Berlin, Prague, Budapest and Croatia, using trains to get between them all. It was three weeks of bliss. We went the Monday after clearing up the wedding party on Sunday and were so exhausted for most of Berlin! If I’d planned it again, I might have given us an extra day or two at home first to catch up on sleep. We were up in Ringinglow, overlooking the city on a walk that we went on when we first met. Very romantic! What was the inspiration behind your ideas? We just chose things we like anyway (we have quite flamboyant style!) and brought in talented friends and relatives. I looked at www.rocknrollbride.com regularly but never bought a wedding magazine! Powder blue rustic vintage farmhouse – that’s a thing, right? What was your first dance and why? We didn’t really have a traditional first dance but our aisle song was Zebra by Beach House and the band played a couple of songs that were special to us as well. Arrggghhhh! With three days there’s so much to choose from! 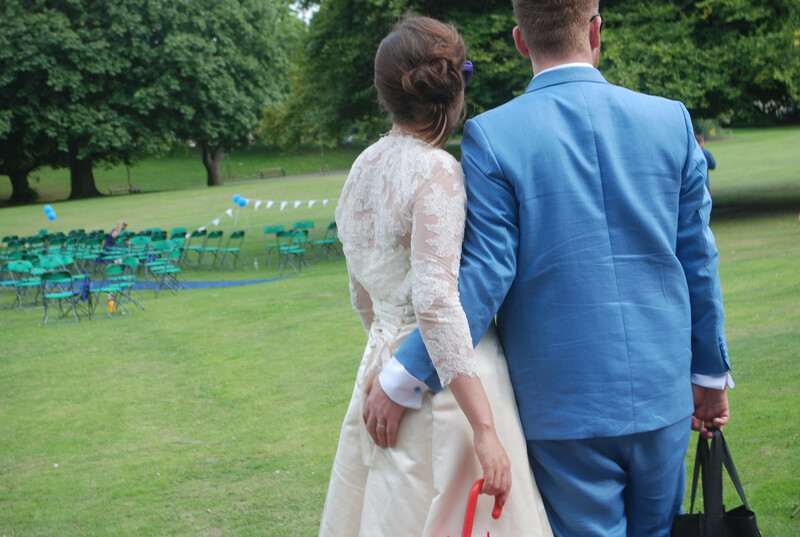 The moment I arrived at Weston Park to see Liam waiting for me was pretty special, as was Liam and I coming down the aisle together (well, across the park…) and seeing all our friends and family looking at us walking in. Do you have any advice for couples planning their wedding day? Don’t worry about other people too much – they ultimately just want you to be happy. Relax and enjoy the day, if you can. Finally, don’t drink ‘breakfast wine’ on the party day…or do, depending on what sort of a day you want to have. What was your best wedding bargain? Making our own wedding rings with Abi Makin (http://www.makinjewellery.co.uk/) which cost about £350 but was a whole day of loveliness with an amazing and sweet jeweller in a gorgeous country studio including lunch and all the materials and finishing and boxes and transport! Plus, we are the only people in the world with rings quite like ours (smug much?)! So overall, I think they were amazing value. Look at the skills you have in your networks and plan in advance on making things as it takes time. Want to share your wedding and thrifty tips? Submit here and remember you don't need professional photos and it doesn't matter if you've had your wedding blogged elsewhere before!